Since receiving a Roald Dahl box set of books as a gift, my family & I have been enjoying reading these classic novels together, and I have enjoyed revisiting stories I read & loved so many years ago. Dahl wrote with such whimsy, combined with a darkness that’s always present, but with happy endings that make for fantastic fantasies. Charlie and the Chocolate Factory and Fantastic Mr. Fox are two we’ve read recently, and both are great stories made into good movies. Here’s another in James and the Giant Peach, a book with a sad element, an adventure unlike any other, and ultimately a pleasant finish that captures the imaginations of adults & children alike. James is a lonely little boy, a lad whose parents died in a tragic accident, and who now lives with his terribly unpleasant aunts on a hill above a village. They treat him horribly, he never gets to play with anyone, and hasn’t left the hill is so very long. What he needs is a little magic to help him out, and that’s just what he gets. A strange man gives James mysterious crystals that, when spilled in the garden, create marvelous results. 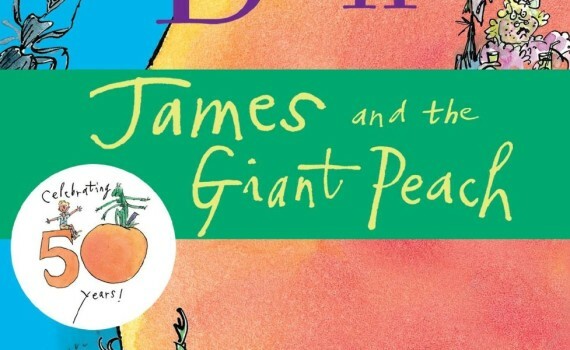 A peach from the garden’s peach tree grows to an enormous size, and when James ventures into a tunnel in its side, he discovers that creatures are living inside the peach pit. And what’s more, they are waiting on him to begin a journey, to leave the hill & to explore the world, all from within one giant peach. What an incredibly entertaining story with more magic than you can imagine. It starts off with the colossal peach, and that’s strange enough, but the creatures inside add an extra element of fantasy that carried the book through to the end. And then there’s the journey itself, the strange things the group sees along the way, the trouble they get into & out of. It’s a great book, one that’s fun to read, excellent to imagine, and always exciting. And the happiness is offset by a bit of morbidity, what with the abusive aunts, the grumpy creatures, the chance of death while traversing the world in a giant fruit. It’s a well-rounded story (no pun intended) if ever there was one, making for a fun read, but with a base of literary talent to support the preposterous plot. Read James to your kids over the course of some evenings or to yourself in two or three sittings; you’ll have a great time either way.